Founded by David and Rebecca Wilkinson in November 2003, Tropical Spice Garden went from being a neglected rubber plantation to one of Teluk Bahang’s most valuable attractions. The eco-friendly project saw judicious landscaping and careful construction in and around existing features such as boulders and trees. A welcome assault on the senses, the green haven buzzes with life and offers plenty to discover. Join daily guided tours led by passionate staff members to get the inside scoop on the garden’s flora and fauna. Alternatively, visitors can go solo by borrowing audio devices from the ticketing counter at no extra charge. An educational and recreational facility rolled into one, Tropical Spice Garden is ‘a people’s garden full of stories’, as described by Katharine Chua, Managing Director of Tropical Spice Garden. ‘We feel it’s our responsibility to share these stories. Plants can’t speak so we’ve become the voice for them’, said Chua. Guests at the garden are particularly fond of the Giant Swing – push off the wooden platform and savour the delicious thrill of seeing your legs dangling high above a vast expanse of greenery. Another popular attraction is the Tropical Spice Gift Shop – a treasure trove of unique gifts from herb-infused bath salts to gourmet spices. But if there’s one attraction worth checking out, it’s the Poison Garden, which officially opened in November 2016. A clear testament to the power of art, the Poison Garden infuses the oft bland subject of botany with an air of mystery and sensuality. The brainchild of Lithuanian designer Tauras Stalnionis, garden curator Kenneth Khoo and illustration studio La Compagnie du Champagne, the project can best be described as part art gallery and part plant nursery. 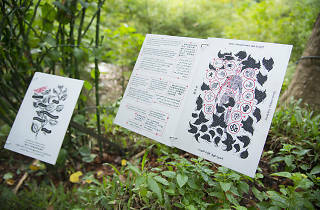 38 types of poisonous plants from all over the world line both sides of a timbre path that meanders in zigzag fashion. 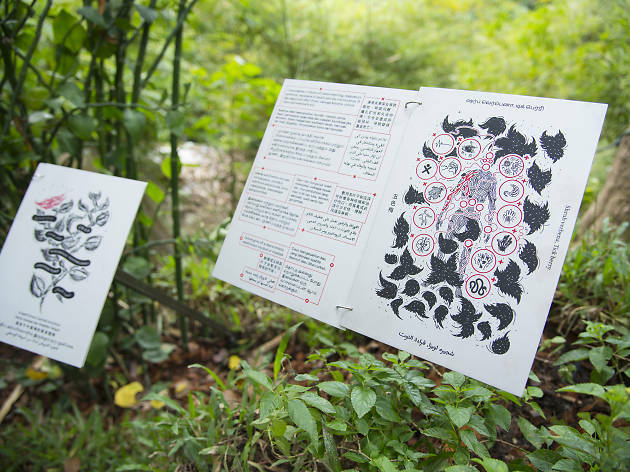 Visitors can discover fun facts about each plant by perusing metal booklets containing abstract illustrations (inspired by the Pioneer plaques) and condensed notes in five different languages (Mandarin, Malay, English, Tamil and Arabic). ‘The term ‘poisonous’ is extremely fluid’, said Stalnionis, drawing attention to the fact that venemous plants aren’t purely malevolent. ‘For instance, a plant may cause diarrhea, but in other cases, you can also use it to detoxify your body – does this make it medical or poisonous? Most medicine kills viruses, but misuse could lead to early deaths. Even hallucinogenic plants can be used in positive and negative ways. What else is poisonous? Everyday substances such as sugar, alcohol and tobacco'.